Chicago, Illinois - A member of the Chicago Teachers Union speaks during a workshop on school violence at the biannual Labor Notes conference. Three thousand rank and file union activists from across the United States and beyond gathered at conference to discuss how to revitalize the labor movement. 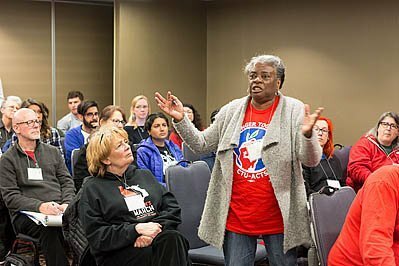 Image Description: Chicago, Illinois - A member of the Chicago Teachers Union speaks during a workshop on school violence at the biannual Labor Notes conference. Three thousand rank and file union activists from across the United States and beyond gathered at conference to discuss how to revitalize the labor movement.